MSC at M. Paulino St. The site was a residential compound complete with a garage and a small yard at the back. In the compound was a two-storey edifice known as the Don Juan Alvero building. The three rooms on the second floor were all converted into classrooms and on the first floor were: a computer laboratory, a typing room, the registrar’s office, and a small office for the software department. There was also a small room for the staff and a canteen at the back of the building. The transfer to the Alvero building was timed so that classes for the second semester of school year 1991-1992 will be conducted in the new site. The building was really designed as a home and the students really found a “home” while MSC was there – a “second home”. All school activities were held there (except for the graduation and sportsfest). The garage was utilized for several purposes – practice session venue for student activities, “tambayan”, venue for presentations where a stage can be put up, and lastly as parking space. The “sala” or living room was used as lobby and reception area but it was also utilized for group presentations and even parties! 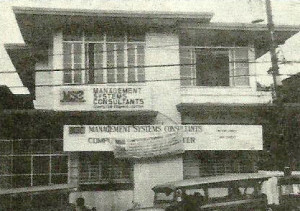 “MSC – 4 on 4”, MSC’s catch phrase for its 4th year anniversary (December 4, 1993) was celebrated at the Jose Alvero building. Many activities were held including an evening of cultural presentations, contests, a party and read this – a school fair! Yes, a school fair in the Alvero compound complete with a jail booth, marriage booth and other gimmicks by the students. This entry was posted in History, MSC and tagged Alvero building, Don Juan Alvero Building, M. Paulino St., MSC, MSC - 4 on 4 on October 13, 2014 by Jose Adonis Duma.